For the British musical band, see Miss Black America (band). The Miss Black America beauty contest is a competition for young African-American women – essentially the black version of the popular Miss America pageant. The pageant has garnered the support of artists, activists and performers including Stevie Wonder, Curtis Mayfield, and Oprah Winfrey. After 40 years, in 2009 the pageant had a "kick off" in Washington, D.C. to rebrand the competition. The first teen winner was Ashley Anglin. The first runner-up teen was Monet Jackson, a resident of Mitchellville, MD; and Destiny Welch, second runner-up and also an MD resident. The adult winner was DC native and MD resident, Miss Kamilla Collier-Mullin. The first runner-up Miss Cherie A. Bryant, a northern Virginia resident; and the second runner up was Miss Janesia Simmons in the adult pageant. It was originally a local Philadelphia area contest to protest the lack of black women in the Miss America pageant. J. Morris Anderson created and produced the Miss Black America Pageant on August 17, 1968, at the Ritz-Carlton in Atlantic City. With support from Phillip H. Savage, Tri-State Director of the NAACP, the pageant received nationwide press coverage as a protest against the Miss America Pageant, an event that Mr. Savage and other NAACP leaders had long condemned for exclusion of black women contestants. 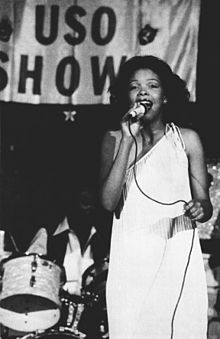 Claire Ford, 1977 Miss Black America, during a USO show, 1978. A short documentary on the Miss Black America pageant was produced by The Czar of Black Hollywood director Bayer Mack and released by Block Starz Music Television as part of its Profiles of African-American Success video series. ^ "The Ritz-Carlton Hotel - Atlantic City" (PDF). Historical Timeline. Retrieved June 25, 2011. ^ "Milestones". Miss Black America. Retrieved July 5, 2013. ^ "Miss Black America: The Pageant Changed History". The Huffington Post. Retrieved 2016-12-18. ^ "Miss Black America Documentary". AASuccess.com. Retrieved 2016-12-18.